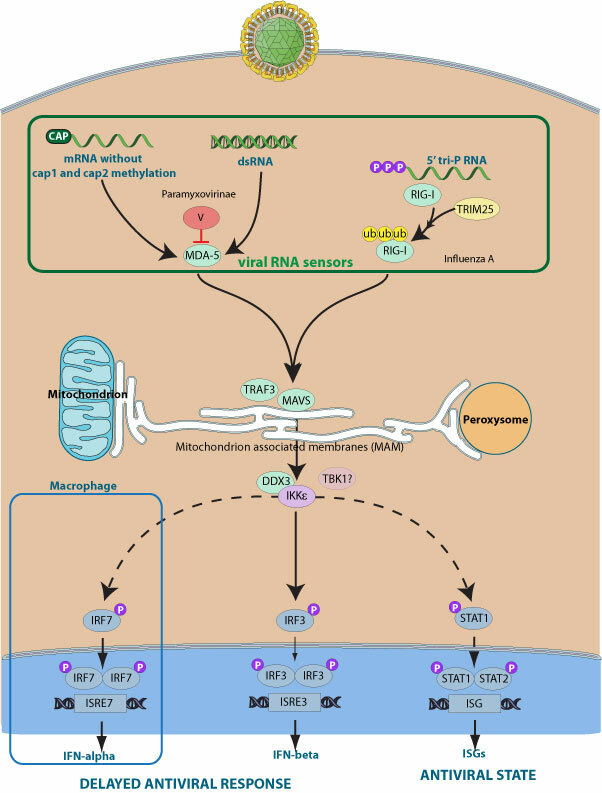 Upon viral infection, the cytosolic receptor MDA5(AF095844:9606) recognizes long viral dsRNAs and initiates an antiviral signaling cascade by interacting with the downstream partner MAVS, located to the mitochondria. This signaling pathway leads to the establishment of an antiviral state characterized by expression of antiviral cytokines and interferons. The MDA5(AF095844:9606) protein belongs to the RNA helicase family. Several viruses encode proteins that directly interfere with MDA5(AF095844:9606) to decrease interferon production by infected cells. For example, all viruses from paramyxovirinae subfamily encode a protein V(O55777) able to interact with MDA5(AF095844:9606) and block MDA5(AF095844:9606) interaction with MAVS, its downstream partner in the cascade. The interaction has been investigated in detail and the C-terminal domain of the V proteins is responsible for the binding of the helicase domain of protein V(O55777).